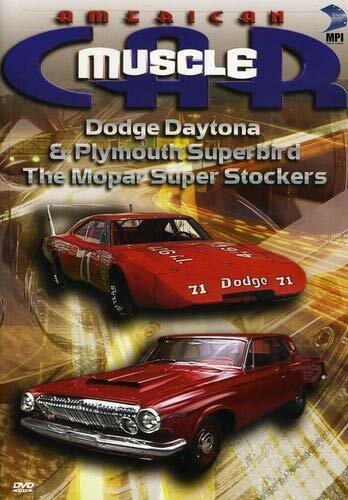 Product Description: Dodge Daytona and Plymouth Superbird: THE WINGED WONDERS -- Built for the superspeedways, but available at your local Mopar showroom, the 1969 and '70 Dodge Daytona and the 1970 Plymouth Superbird were the essence of what the Musclecar was (and is) all about. These cars were offered with the 440 Magnum engine, or the legendary 426 Hemi. They never won any gas-mileage awards, but who cares? The Mopar Super Stockers: JUST PLAIN FAST -- From 1963 through 1966, before man walked on the moon, there were the 426 Max Wedge and Hemi Plymouth Belvederes and Dodge Coronets. These plain-jane business coupes with the huge engines blew away everyone in the NHRA Super Stock classes, and gave Chrysler Corporation a huge advantage over their competition in the Muscle car era.